Self Storage Marketing & Web Design | Automatit Inc.
We know a few things about developing high performing websites. We have been building them for over 2 decades, and we specialize in self storage. When it comes to developing a website, we are second to none as we create user friendly, results driven designs to help you reach your unique business goals. SEO as it is often referred to is what we do. Understanding how the techniques of the past are just that, in the past, we focus on what Google is looking for today. This will get you better organic search results. PPC, as it is often called, is when you find new customers. Organic results are great but they are a long term strategy whereas Paid Search can deliver you results quickly. Need to know why you don’t have as many conversions as you want? Our team can find out what might be causing that problem for you. With a non-biased analysis of your competitors, you might just see through the eyes of your potential customer. Having your phone number, address, email, website and even operating hour data across the web is crucial in today’s world. Our Local Listings team will ensure your business information has integrity. What are people saying about you online? We can help monitor and notify you of anything that might hurt your reputation so you can be sure to respond quickly and hopefully turn a potential problem into a happy customer. STAND OUT above your competitors? We offer Digital Marketing Services that can help you take your self storage business to the next level. We are so pleased with Automatit. They were helpful and made it so easy for us. There very creative and will walk you through the project from beginning to finish. There knowledge and customer service is awesome. We are so happy with our new website! Thanks Automatit! Heather and Kelly from Automatit were very friendly, courteous, and their customer service was top-notch. They were patient through our yearlong process to complete our website and worked with us to create a website we're happy with. I would recommend their service to other self-storage business owners. Cheers! If you are looking for a web team to truly take you to the top with expert advice, beautiful design, and data-driven results, then Automatit, Inc. is definitely your A-Team. Once again you guys are the bestest!!!! It’s been so great to work with a company that is friendly and provides great customer service. After working with Sean Wolff over the last few weeks I’ve been super impressed on how he keeps notes of our conversations and follows through with a return call or email in order to provide answers to any questions that needed research. I’ve found this same customer service mentality with the gals who answer the phone, John Curtis and all others at this company. I would highly recommend Automatit for your website design and marketing program. I’m am very pleased with the Automatit team in the development and implementation of my self-storage website! Excellent partner with my business. They have had a major impact on the growth as customers search over the internet. 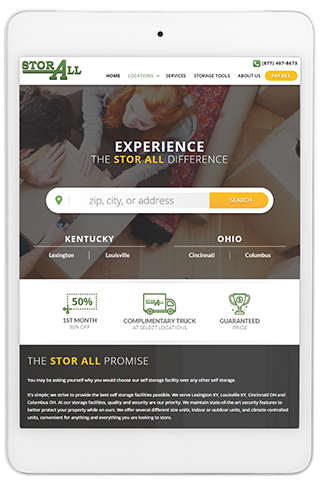 The dedicated team at Automatit did an excellent job at redesigning our Stadium Self Storage website making it clean, modern and easy to navigate. They integrated seamlessly into our unit management software, allowing us to publish our rates to the web, as well as rent and reserve units online. If you are in the self storage business, and want a successful web presence, then you need Automatit as your partner. Our experience with the Automatit team has been exceptional at every level. They have been incredibly responsive and exceeded our expectations with our new website design. I would highly recommend working with them for self storage web design. Over the past 2 months, I have been working with Automatit to develop our new website. It went live recently and I want to share that it was a pleasurable experience to work with them. Their team is comprised of highly qualified, professional people and all have an abundance of sincere caring to please the customer. Having owned numerous businesses throughout the U.S. over the past 41 years, I know the critical importance of those qualities to a successful business. While there may a bit more fine tuning to do, I am very pleased with our website. Sean Wolff and his marketingteam at Automatit are invaluable to our business. In just a few months, they not only helped us greatly improve our Google listing, but also assisted in tighten our marketing message, online, and carry it in-office and on paper. Sean is a true professional in meeting deadlines, and communicating. He is backed by an expert design squad to collaborate on ideas and deliver user friendly design. I truly enjoy working with Sean and his team at Automatit and the expertise they provide. I have worked closely with Chris Baird and his excellent team at Automatit for the past half dozen years or longer. Prior to that our websites were not strong producers and lacked much luster. Recognizing that had to change I attended an SSA storage conference with a mission to meet and discuss solutions with each of the web site companies exhibiting. As you can imagine I heard many sales pitches with most claiming they could walk on water in addition to driving ten times the traffic to my door. Sure you can..... One of the last people I spoke with that day was Chris Baird who had a refreshing approach - he was honest and humble but very sincere. Chris gladly explained what he could do and could not do. I was very impressed by his approach and obvious knowledge of his business so I hired Automatit to make over a web site for our largest client. The team at Automatit made it a very easy process and really knew what would work best. I really learned a lot from them about their process which is not just building a very effective web site but then marketing it for maximum exposure. In addition to all of this their price is very fair. Within 90 days we saw a 30% increase in online rentals which continued to grow month by month and still improves year over year thanks to their frequent tweaks and refinements. In my opinion Automatit is as cutting edge as it gets and I would never consider any other web developer/manager for our business. One of their best assets is the their team who are professionals but also caring and work hard for their clients. If you want the best, call Chris today. You will soon consider it one of the best moves you've made for your business. We highly recommend Automatit. 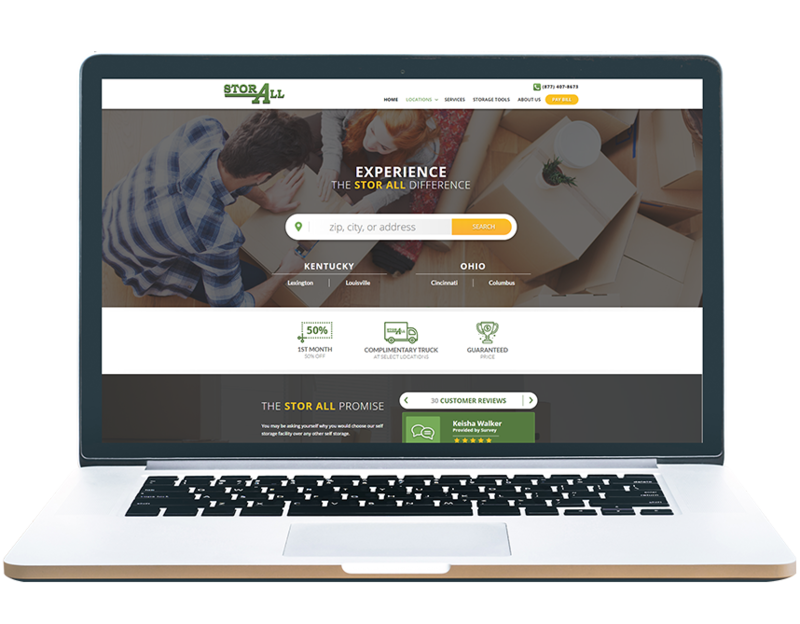 They helped us design an attractive and easy-to-navigate website for our self storage business. When we request changes, they are quick to respond. Most importantly, the website functions really well, with a large portion of our customers making reservations for rentals on the website. I've been a customer for many years. They do a great job with my website and SEO! Automatit is an incredible company to have working for me. They are creative, informative and beyond helpful in building an online presence. I recommend their services to any one who wants a quality design website, great feedback from customers, and amazing customer service. Automatit is top notch and I am thankful that they were able to help me even though I am in the Southeast! I feel Automatit is a leader in their space and keep on getting better year after year with new analytics and technology. I have been with them for over 5 years, love working with my marketing specialist Julia and everyone else on the Automatit team. Automatit is a great company to work with! Their staff is very friendly, and their customer service is top of the line! They always go above and beyond when answering questions or making updates to our website, and they are very timely. Highly recommend!